Discounted fees in parentheses are for early registration before 4/1/2018. 现场会给参展的个人或团体提供免费上网和电源/Free wifi and electricity will be provided to vendors. Sponsors’ logos will be placed on OCC official website till next year’s community fair. Sponsors with $500 and more will have a table for free. All vendors’ names and contacts info will be kept here till next year’s community fair. 画家李铁/Artist Li Tie He works primarily in charcoal, oil and mixed media and his favorite subjects are human faces, history, culture, and nature. James E. McCandlish OCC法律顾问/Glad to answer any legal questions. IBE Electronics USA, LLC IBE provides full range of pcb manufacturing and PCB assembly services. UST Global UST Global is an American multinational provider of Digital, IT services and solutions, headquartered in Aliso Viejo, California. 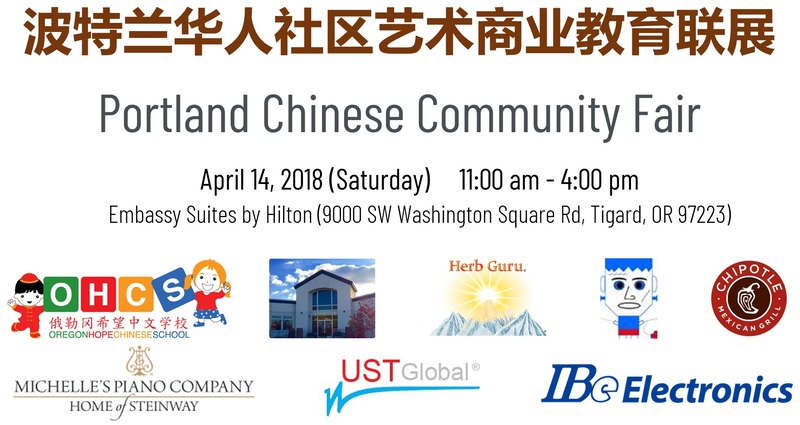 华人服务中心/Asian Health & Science Center To be the bridge between Asian and American cultures and build a harmonious community, with the vision to reduce health inequity and improve health care quality for all Asians. Michelle’s Piano Company Willing to partner with our community for the best quality pianos and services. Life Changing Dinners Cooking schools, cooking classes, and cooking equipment. Spark Technology Education Connect students to Robotics programs, and bring in local professionals as mentors to provide quality instruction. 西北中文书院/NW Chinese Academy We create confident and critical thinking global citizens through an innovative full-time Mandarin immersion program. MiT Education & School Learning should be fun as well as challenging and that every child should have the opportunity to learn, create and grow! Oregon Chinese Flagship Program The Flagship program offers academic support, study abroad opportunities, and scholarships to help students reach professional-level proficiency in Mandarin by the time they graduate, while studying any major. Haiyan International Dance Academy Haiyan International Dance Academy‘s curriculum emphasizes development of strong technique, appreciation for various dance styles and discovery of the joy of movement and expression, we are committed to provide the highest quality dance training to students at all levels. Tech for Kids Founded by parents and local industry experts, we pool resources and expertise together, and create a platform to help youth discover their interests and accelerate their skills in STEM and leadership. Oregon International Ballet Academy We believe that we are not only teaching ballet, but instilling positive energy to allow students to achieve their dreams for the future. Engineering for Kids We are passionate about our programs because we believe that early exposure to STEM education has a lasting impact on a child’s future. We put the excitement in STEM education by offering fun, hands-on learning for children ages 4 to 14. 澜苏园/Lan Su Chinese Garden Lan Su Chinese Garden is a member based nonprofit organization. Lan Su is an authentic Chinese garden built by our sister city Suzhou China. To inspire and encourage young artists in the community, OCC is providing a platform to display their works in the Community Fair to showcase the artistic creations. To participate: An artistic creation from young artist’s age (18 and under). Expression or creation methods can be water-coloring, oil painting, etc. Also, an opportunity to interact/network with local artists. This is a free event. Please arrive at least half an hour in advance to place your work. The Community Fair committee has decided to add another dimension to the extra-curricular life of our children. We have the honor to invite Ms. Kerry Yu, a renowned producer in the fashion industry in both China and the United States, to organize a children’s run-way show. We invited 5-16 year-old children to register and be part of it. An audition was at 7:00 p.m. on Friday (4/6) in Bethany Community Room. Children who are participating in other performances on that day are also welcome to register. The Simpson and Staphine are two brands that we are showcasing at the fair. Clothing are provided. A training session will be held at the Embassy Suites by Hilton on the evening of April 13th at 7:00 p.m. The run-way show will be at 3 p.m. on the day of the event. 用于抽奖的票可以在门口购买/Raffle tickets are available for purchase at check-in desk. All ticket sales are final at the time of purchase. There are no refunds. Prize winner’s ticket stub will be drawn from one drum which includes all ticket stubs. Each stub has an equal chance of being drawn. Odds of winning will be based on the number of tickets sold. If a ticket is drawn and nobody claims the prize, another ticket will be drawn. Acceptance of a prize constitutes permission for OCC to use the winner’s name, and photograph in any OCC publicity worldwide in all media including the Internet without additional compensation. By participating in the Raffle, participants agree to be bound by these Official Rules.